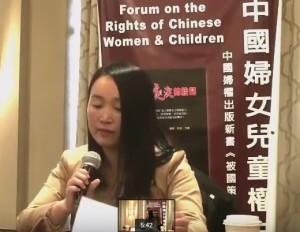 March 15, 2016, two NGO organizations Women’s Rights in China (WRIC) and Women’s Rights Without Frontiers (WRWF) collaborated to hold “Form on the Rights of Chinese Women and Children” in New York. Nearly a hundred attendants including US-based human rights activists, scholars and journalists were at the forum. Yujun Zhang, researcher of WRIC; Cheng Yao, staff director of WRIC’s Mainland Project; Eva, editor of “Fetuses Executed by State Policy”; Reggie Littlejohn, president of WRWF; and Jing Zhang, president of WRIC presented and examined the current situation of women’s rights in China, tracing the development of China’s Women’s Liberation Movement 20 years after the Beijing World Conference on Women, reviewing on how forced abortions affected the physical and psychological health of women and children since the One-Child Policy put into force 36 years ago, analyzing how the One-Child Policy is connected to child trafficking and international adoption. Dr. Gao Yaojie, the first Chinese medical expert in China to fight AIDS donated her 100 books to the attendants of the forum. 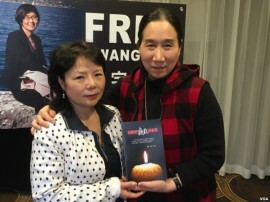 The forum also exhibited the book “Fetuses Executed by State Policy” edited by Eva and Peng Wang, and the book “Witness on Cannibalism” an oral history of Great Famine by Eva. WRIC has facilitated to publish two books under the China’s Family Planning series, including “Fetuses Executed by State Policy” and “Orphans of Shao” within the past two years. WRIC will continue to publish these non-fiction publications under the same theme, striving to thoroughly record the reality of how Chinese families, especially women and children suffered from this coercive enforcement of Family Planning. 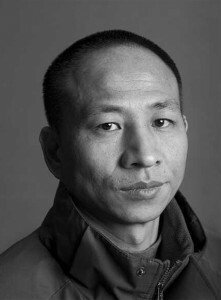 The forum first featured a video speech from the well-known Chinese journalist Shangguan Jiaoming. 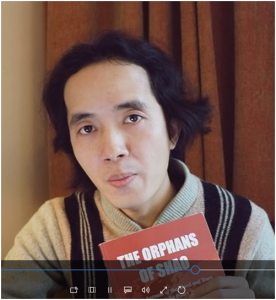 He acknowledged WRIC and Ms. Jing Zhang for translating and publishing the English version of his book “Orphans of Shao” . This book detailed the real crimes of Family Planning officials in Shaoyang of Hunan Province, who kidnapped those “out-of-plan” children from their families to state-run orphanages, gave them new identities, and sold them for international adoptions. 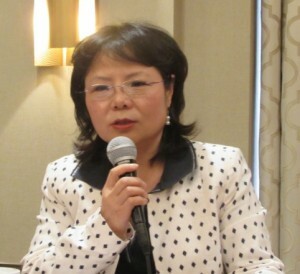 Yujun Zhang (see figure) summarized the development of China’s women rights movement with images and charts. 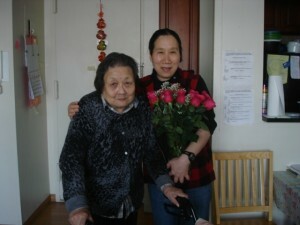 She said that the coercive One-Child Policy launched in 1979 was the start of a disaster for Chinese women. Xi Jinping government did not improve but worsened the situation of women’s living condition, and put unprecedented pressure on feminist activists and NGO organizations, which made the Chinese women’s rights progress almost 100 years backwards. 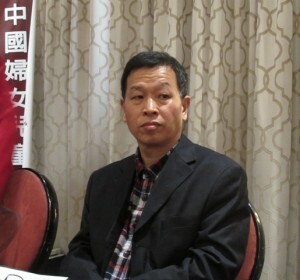 Cheng Yao also said that the Chinese Public Security Bureau not only show little interest of finding the missing children, but also treat the parents alliances as target of “weiwen” or “stability maintenance”. “Almost every parents went out in groups had been taken to the police, or even been detained” said Cheng Yao. President of WRWF Reggies Littlejohn (see figure) pointed out that the Chinese government implemented Two-Child Policy is merely administrative measure dealing with labor shortage and the aging of population. Forced abortion and “out-of-plan” penalty were not abandoned by the new planning. Thus, people are still suffering. 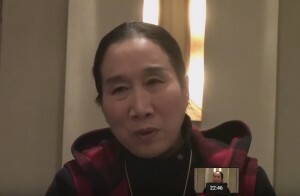 Reggie also mentioned that her adopted daughters Anne and Lily (Chinese activists Zhang Lin’s two daughter) had been doing great and how proud she was of them. In 2013, Zhang Anne was denied the right to go to school in Hefei. This caused hundred of people and online commenters went on protest. More than ten people was arrested or persecuted by CCP government. So the founder of WRIC Jing Zhang contacted the Director of USUIB Ann Noonan, trying to help Anne out. They then called Reggie to see if there is someone who would want to adopt Anne in the US. Reggie discussed with her husband and gladly took the responsibility herself. Now Anne has been family to Reggie for two years. She is straight A students and just won award in an international piano competition. She is going to perform in the Carnegie Hall in December this year. 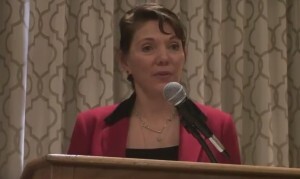 Eva (see figure) is the oral history researcher on the Great Famine, and editor of the book “Fetuses Executed by State Policy” published in 2016. This book collects eighty-four cases of forced abortions in China. Eva said that a country where women do not have control over their own uteri is a country of savagery and inhuman. Only a complete abolition of this “Planning” and fining policy can allow Chinese people to live with dignity. 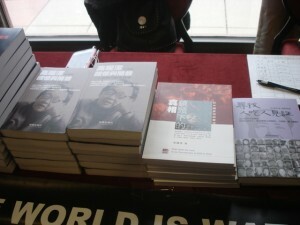 Eva also introduced the other editor of this book and Beijing-based human rights artist Peng Wang. They strive to arise people’s respect for human right and lives with words and art pieces. The last speaker is the founder and president of WRIC Jing Zhang. She screened a video of WRIC Mainland volunteers leading parents of missing children to look for their offspring . Anti-trafficking is one of WRIC’s important projects. She said that playing this video is to give Chinese people living in the US an idea of what WRIC does in China. 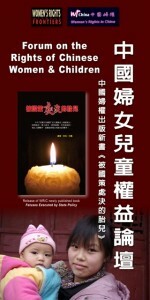 Since the establishment of WRIC in 2007, we have been working low-key to speak and fight for the vulnerable and disadvantaged groups so that the CCP would not censoring out projects and activities; but after Xi Jinping came to office, all the NGO organizations were suppressed as foreign anti-government forces. Jing said that the rule of CCP has a solid social basis besides its national defense and economy foundation. The interest groups closely tied with CCP includes more than 87 million CCP members, 2 million active duty soldiers, 1.5 million armed police, 7 million reserve militia, 2 million regular police, 2.5 internet police, 7million cadres, and of course the large system of Family Planning Commission. Basically, these 200 million people’s job duties include being CCP’s watchdogs, following, bugging, informing and being the CCP hatchet men. 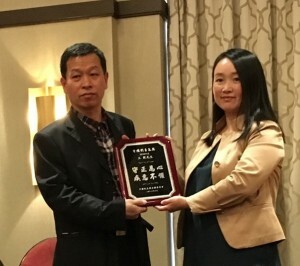 At the end of the forum, the National Committee of Democratic Party of China gave 2016 “Cao Shunli Courage” awards to Chinese human right activists Changlan Su and Mo Wang. an ideal means of writing? I have a presentation subsequent week, and I’m on the look for such information.